Stacy Yates Nutrition: Try This Tuesday: Breathe! Of course we all breathe, but HOW are you breathing? Are most of your breaths long and deep or are they short and shallow? How much thought do you actually give TO breathing each day, and slowing both your physical body and mind down? All of us can truly benefit by setting aside a few minutes each day to connect with our bodies, our emotions and our breath. In the past, I have overcommitted to unrealistic meditation practices, but I do recognize that I need to carve out at least a few moments each day to slow down. Dan Harris even argues that 1 minute of meditation each day is better than ZERO! I agree. 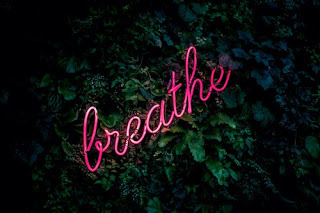 I have been using a short 3-minute breathing exercise from psychologist and fellow Pro Aging Programs collaborator, Nikki Pearson, and I invite you to try it as well. (It’s free). You’ll be able to download this short audio clip to your computer and use it daily. (Head to http://www.proagingprograms.com - under the Emotional Health category). Why not create a daily habit of completing this short 3-minute breathing exercise before you set down to complete your work for the day? Or at the end of your workday, just before you head home to see your family. Or at the end of your day, just before you lie down to bed? Remember when we talked about habit stacking? This would be a great thing to stack onto any one of your regular activities for the day. I personally have started this exercise right before I sit down to work at my computer, and it’s truly been a wonderful way to begin my day. When are you going to take your 3-min break?